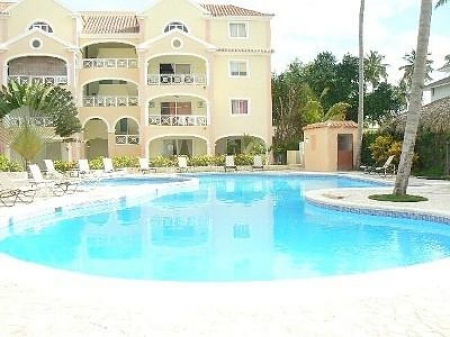 Apartment/Condo for Rent in El Dorado, Cortecito, La Altagracia PUNTA CANA/BAVARO FROM US$ 350,--per week , $ 50,--per day,monthly on request STUNNING APARTMENT EL DORADO VILLAGE 300 METERS FROM THE BEACH FOR 2 PEOPLE For more infos email: jens.corinna at yahoo.com VISIT WEB SITE puntacanarental.egoditor.com � You are in the ideal community since it is just an easy 4 minutes walk to one of the nicest beaches in the Dominican Republic and comes with all of the necessary amenities. The apartment 56 sqm has a seperate bedroom with a queen size bed and airconditioning, kitchen w/ micowave,coffeemashine,cooking utensils etc ,ceiling fan in living,.and bedroom, private 10sqm. balcony w/ furinture and a partial view of the swimming pool, sliding screen door to prevent insects from coming inside the apartment, Living/Diningroom contains tv,sideboard,coffeetable,diningtable w/4 chairs,sofa,aswell you will find an iron/ironing board ,washingmashine and spinner..Sorry no pets allowed.� � You will get fresh, clean towels, beach towels and linen.All you need you can buy at the local store/grocery/supermarket a few steps away. . �A car is not needed as you can also find numerous restaurants, bars, clubs, grocery store,carrentals,bus,taxi and shops within walking distance This apartment is located in El Dorado Village which is a modern village situated on the East coast of the Dominican Republic, in the town of B�varo and only 15 minutes from the International Airport of Punta Cana and the Hospital.� � It is only 4 minutes walk you will find a free beachaccess to the fine white sands of world renowned Bavaro beach in Punta Cana where you can just relax, go for long walks, sun bath or go for a swim. The residential community of El Dorado Village is provided with mutual green, private parking, garden with a large swimming pool free use of sunbeds,a free WIFI spot and 24 hour security.� � Inside the village there are shops including a pharmacy, supermarked, bakery, gym, restaurants and sports bar are all on-site and many more.� � Enjoy the Beach Club , chill out beach bar and restaurants where you can be served breakfast, lunch, and dinner and listen to nice local music. � � A 3 minute drive will get you to the Cocotal Golf Club and the Palma Real Shopping Village home to the Hard Rock Cafe, Tony Romas, Sushi, movie theatre, banks and many stores . � Other nearby attractions, diving(scuba), boat tours & water sports. 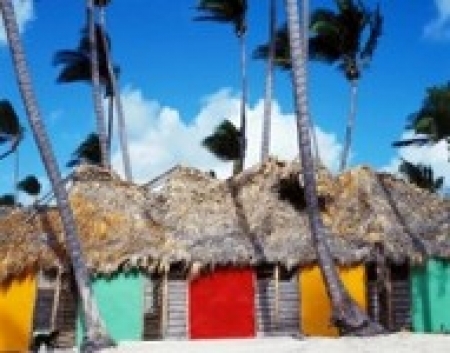 There are many excursion companies within the area so you can review their offerings for para sailing, deep sea fishing, windsurfing, snorkeling, airboat and many more.� � El Dorado is the ideal spot for those who like convenience and comfort within their fingertips and easy free access to the beach. 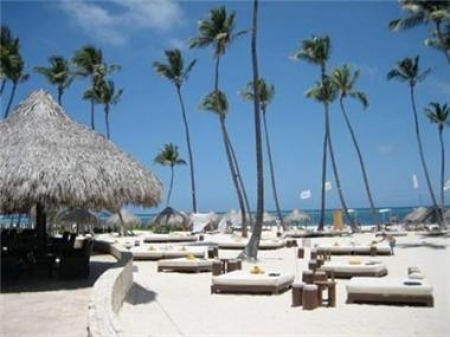 This is without a doubt one of the best deals in all of Bavaro, Punta Cana! � � Cocotal Golf & Country Club is just a 4 minutes drive from the apartment. 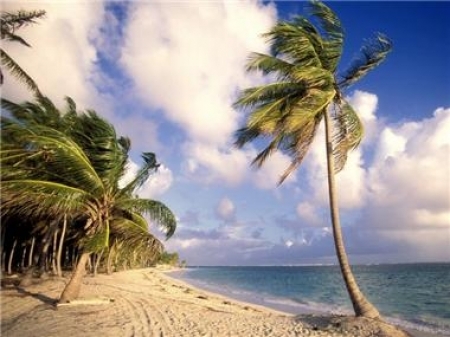 It is surrounded by beautiful lakes and coconuts trees. It is a great course for beginners and experienced golfers. 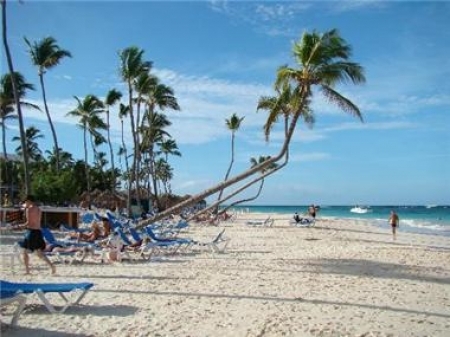 it is a gated community located in Bavaro.�Whitsands golf you can reach in 8 minutes . Enjoy a stay in this stunning apartment in a great location.